Effetre Light Ivory is a pale, neutral opaque colour that is very soft and somewhat 'grainy' in consistency. It has a tendency to curdle and spread, although some batches of it are less prone to do this than others. When I first started lampworking, I had a batch of Light Ivory that was great for making flower petals. If you look back at my test results for Light Brown Transparent, you will see an example of a flower there that I made with Ivory and Light Brown. My most recent batch of Ivory wouldn't do this as well because it likes to feather and spread on top of transparent colours. Ivory, as you can see, is very reactive with silver. Silver spreads out on top of Ivory, and the reaction takes over a great deal of the bead. The reaction is in places bluish, and in others yellowish and in still others just dark or light grey. It's neat though, and reducing and encasing it doesn't change it much. Silver glass is nice on top of Ivory. I particularly like reducing silver glass on Ivory... I don't usually have a lot of luck with the striking silver glass colours on top of it, but I did get some colour in my TerraNova2 frit and I like how each bit of frit has developed its own discrete outline. On top of Tuxedo, Ivory sort of 'flees to the middle' of itself, leaving the outside part of the dots and stringer lines looking oddly faded and three-dimensional. When I used Tuxedo on top of Ivory, there is a hint of bleed around the Tuxedo dots and stringer lines. Ivory and Copper Green develop a mutual dark line reaction. Also, the outline is irregular, particularly where Copper Green is on top of Ivory, and has little spiky bits poking out of it. On top of Opal Yellow, Ivory develops a greyish outline. 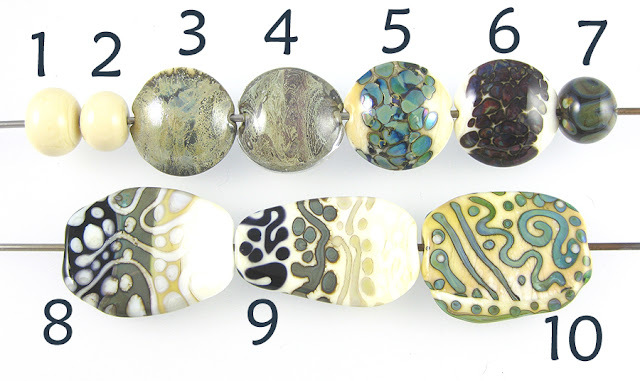 When Opal Yellow is used on top of Ivory, the outline is more pronounced, looking like sharp crevices around the Opal Yellow dots and stringer lines. 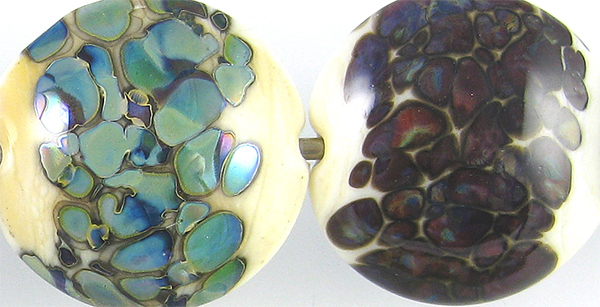 In both cases, the Opal Yellow wherever it surrounds the Ivory seems to take on a slightly greyish hue. There's not much to report in terms of reactions between Ivory and Peace. There's some separation, I think, but it's hard to tell because it's hard to see, even with the bead right in front of me.